All hail the mini break. We’ve all felt the dreaded 9-to-5 burnout, but thanks to the weekend escape, we can recharge without dipping into that precious annual leave. Enter: Magnetic Island. Just a short flight to Townsville and 20-minute ferry to the island, you’ll find a stunning white sand isle full of secluded bays, ‘gram-worthy hotels and an underwater wonderland begging to be explored. To help you beat the burnout, we teamed up with Visit Townsville and curated the ultimate weekend guide to this island paradise. If Magnetic Island isn’t already on your hit list, it will be after reading this. Though this idyllic island boasts untouched serenity, there’s still a bevy of luxury hotels nestled amongst lush mountainous terrain so you can rest and rejuvenate in style. If you fancy afternoons lazing by the pool soaking up vistas of palm trees and mountains in the distance, then Peppers is for you. The stunning rooms boast sun-drenched balconies, private pools, and freestanding bathtubs with views of the Coral Sea and a private marina. With a dream stay like this, you’ll never want to check out. Thrillseekers, listen up. 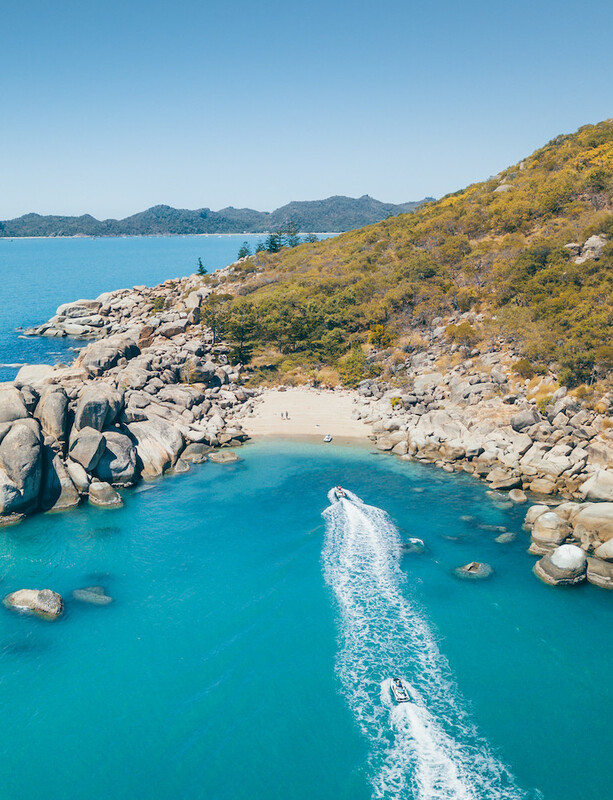 Magnetic Island has an unparalleled lineup of jet ski tours and you need to get involved. You’ll be guided around the rugged coastline for a fast-paced perspective of the island. Soak up views of golden sand, crystal clear waters, and turtle nesting grounds. If you’re visiting between July and September, you might even spot a whale. With shallow warm waters year-round, Magnetic Island is the ideal location to explore the Great Barrier Reef. There’s two self guided snorkel trails, or you can sign up for a tour and see the reef from other locations littered around the island. One self guided option starts 390 metres from Geoffrey Bay opposite the Arcadia Hotel. Follow the white numbered floats and head towards the Moltke shipwreck where you’ll spy schools of fish. Stronger swimmers should check out the WWII aeroplane propeller and engine block (from a CW-22B Curtiss Falcon) for a deep dive into history. The Nelly Bay trail is another must-do, and starts just north of Base Backpackers. Just remember: never stand on the coral, we want everyone to enjoy the reefs beauty for generations to come. 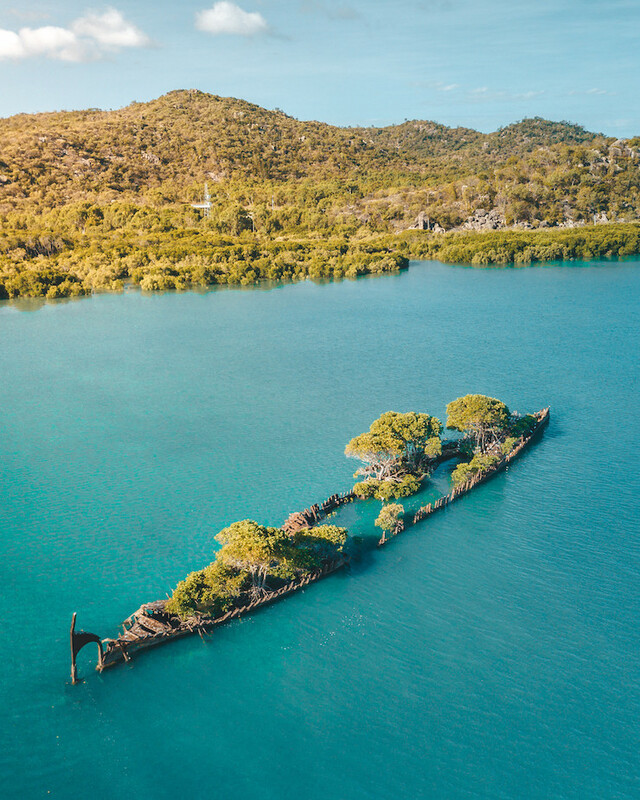 What was once a forgotten shipwreck has now become an artificial island and home to lush greenery and birdlife. The City of Adelaide was a passenger steam ship from Glasgow, Scotland that was gutted by fire in 1912 and in 1916 the burnt vessel came ashore in Cockle Bay, just 300 metres off the coastline of Magnetic Island. The shipwreck is best viewed on an Aquascene tour and is a true marvel you won’t find anywhere else in the world, so you better immortalise it on the ‘gram. On Magnetic Island you’ll stumble upon incredible beauty no matter where you turn, but the Fort Walk is an absolute must-do. The trail is four kilometres and takes approximately one and a half hours to complete. Start your journey at the corner of Horseshoe Bay and Radical Bay Road, and wind your way to the historic WWII fortification to soak up the uninterrupted 360-degree views of the island. Along the way, keep your eyes peeled for dozing koalas in the trees. Discover secret beaches, marine life, and spectacular beauty on a sea kayak sunset tour. 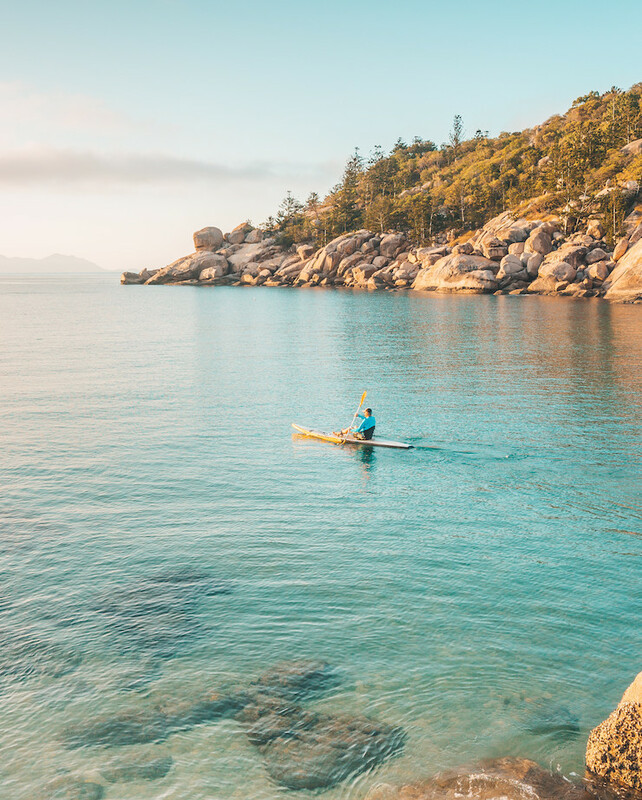 You’ll be guided around Horseshoe Bay’s calm waters, drift over seagrass beds and coral gardens, and enjoy chance encounters with turtles, dolphins and whales if you’re visiting between July and September. Rest and recharge post-paddle at a nearby bar with a tipple in hand to catch the last rays fall behind anchored sailboats. Pure bliss. If you’re considering a getaway to this stunning white-isle, then you need to jump on these flight deals. Fly from Brisbane to Townsville from $95*, or Sydney locals can fly from $145*, or depart from Melbourne (Tullamarine) and enjoy prices from $135*. *One-way, checked baggage not included. Not available on all flights or days, conditions apply. Been bitten hard by the travel bug? Thanks to Visit Townsville you can start planning your mini break to Magnetic Island and with incredible deals like these your dream holiday just became a reality. Editor’s note: This article is sponsored by Visit Townsville and proudly endorsed by Urban List. Thank you for supporting the sponsors who make Urban List possible. Click here for more information on our editorial policy.